Michael Clark records that ICEROCKS LONDON used 732 white round brilliant-cut diamonds with a total weight of 2.975 carats, and 4070 black round brilliant-cut diamonds with a total weight of 20.484 carats. The white diamonds range in size from 0.75 to 1.4 mm, the black diamonds from 0.7 to 1.35 mm. The weight of silver is 166.39 grams. Each face of this two-sided sculpture is set with black and white diamonds which form a portrait of Francis Bacon, whom Michael Clark (born 1954) met at the Colony Room Club in Soho in 1977. He made a number of portraits of Bacon, including a drawing now in the British Museum. The V&A has one of the drawings he made of Bacon’s studio in Reece Mews, London SW7 amd the double-sided working drawing for the sculpture. The title is a quotation from the occultist Aleister Crowley (1875-1947). Clark created the sculpture as part of a larger project, Beautiful Dreamer. Perhaps I sleep and Dream U, a digital projection in which the animated sculpture of Bacon appears and disappears under the eyelids of Tilda Swinton. 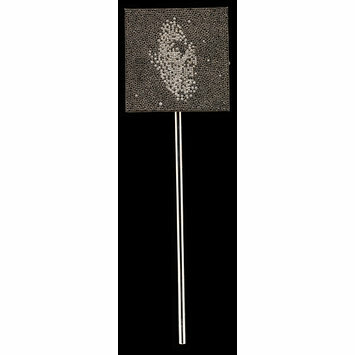 This sculpture is a two-sided silver square mounted on a silver rod. Each face of the square is set with brilliant-cut black and white diamonds which form a portrait of Francis Bacon. Both the faces incorporate some of the stars of the Great Bear. The star in the inscription around the sides of the square is centred by a fragment of meteorite. Around the upper three sides of the square is engraved in script: '... every man and / every woman / is a [representation of five-pointed star] ...'. Created as the first of three artist's proofs by Michael Clark and made by ICEROCKS LONDON in 2008/9. Working from his original drawings for the design, Clark allocated and supervised the positioning and layout on a computer screen of the 4802 diamonds, which are of varying sizes. Michael Clark met Francis Bacon in the Colony Room Club in Soho in 1977 and, at the suggestion of Valerie Beston of the Marlborough Gallery, made the first of a series of portraits of him. A drawing of Bacon was acquired by the British Museum, and the V&A has a drawing by Clark of Bacon's studio in Reece Mews, London SW7, as well as a number of other works which relate to Clark's exploration of wounds. His Five Wounds were created for, and installed in, Chichester Cathedral in 1994. Like the Wounds, the size of the square of Every Man and Every Woman is a Star is 2.236 inches, the square root of five. The double-sided working drawing for Every Man and Every Woman is a Star is in the V&A's collection of drawings. On the background to the portraits the constellation of the Great Bear is picked out in white diamonds. As with many aspects of the work this has more than one resonance: not only as a group of stars, but as a reference to Michael Clark’s study of wounds. One of the earliest Ancient Egyptian scalpels has the shape of the Great Bear. The title, Every Man and Every Woman is a Star, was taken by Clark from a second-hand book on gems which he purchased in 1973 from an antiquarian bookshop. It is a quotation from Chapter I of The Book of the Law by the occultist Aleister Crowley (1875-1947). Michael Clark created the sculpture as part of a larger project, Beautiful Dreamer. Perhaps I sleep and dream U, a digital projection in which the animated sculpture opens and closes, appearing and disappearing under the eyelids of Tilda Swinton. The two images of Bacon face in the same direction so that if the rod is spun a three-dimensional image of the portrait is created, with the constellation of the Great Bear flickering in the background.